Old Ebbitt Grill, one of America’s oldest restaurants. 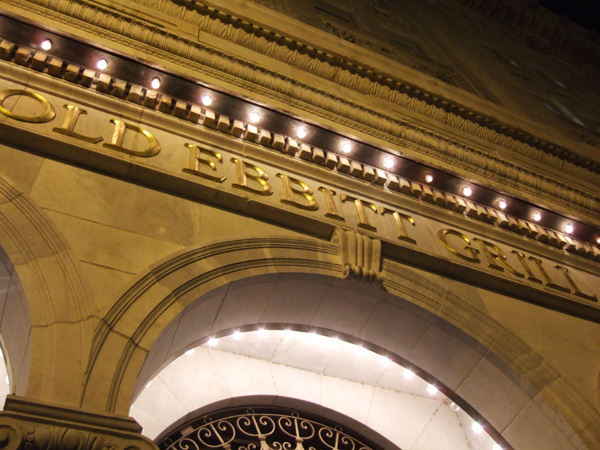 Old Ebbitt Grill has been in continuous operation since 1856 and is one of the oldest restaurants in the the United States. On a recent trip to Our Nation’s Capitol, I decided to stop in for dinner. It’s moved several times in it’s 150 year history, most recently in 1983, so I didn’t expect much from the interior. But upon my arrival in the dining room, I was charmed: the interior had the luxury of a late-19th century restaurant and featured taxidermied animals (always a plus in my opinion) and real gas lighting. The flickering gas light chandeliers gave the dining room a wonderful ambiance and a real feel for what dining in the 19th century would have been like. In an establishment like Old Ebbitt, I should have gorged myself on oysters and beefsteaks, then finished out the event with a glass of port and cigar. That would have been the period appropriate thing to do. But my budget was lacking and my stomach protested, so instead I had an arugula salad with toasted hazelnuts, blackberries and sherry dressing. Not very 19th century, but it was very, very good. 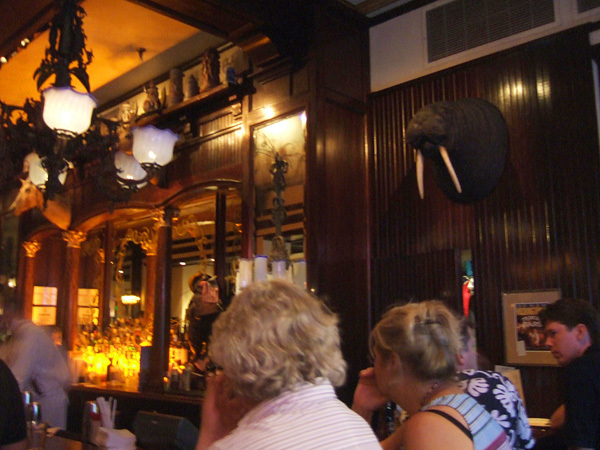 Real gas lamps and a taxidermied walrus head: my idea of a good time.